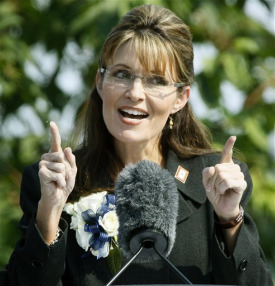 " We lost by just this much"
The Month of August has not been kind to Sarah Palin. The former half-term ex-quitting governor of Alaska has gone 0 for 5 this month with regard to candidates that she has endorsed for election. This week both of the candidates Palin backed in Tuesday’s primaries lost their bids. In Washington State, Palin had backed Tea Party activist Clint Didier in his bid for the Senate over businessman Dino Rossi, the favorite of national Republicans. Didier lost. In Wyoming, Palin endorsed Rita Meyer, whom she christened as one of her “Mama grizzlies” for governor. Meyer also lost. Of Didier, Palin said the Tea Party favorite “inspired” her and that he is a “patriot running for U.S. Senate to serve his state & our country for all the right reasons”. As for Meyer, she said, “voters know that Rita has a unique blend of steel magnolia and mama grizzly”. In each case however, the voters made it clear that they disagree with Sarah Barracuda. In addition to Tuesday’s losses, there was the even bigger disappointment last Tuesday, when Palin’s hand-picked gubernatorial candidate in Georgia, Karen Handel, lost to fellow Republican Nathan Deal. Palin had exerted all of her efforts in that race even appearing with Handel at a campaign rally just hours before the vote. All to no avail however, as Handel was handily defeated. Also in August, Palin-backed candidates Rep. Todd Tiahrt, who was vying for Senate in Kansas – and Tennessee congressional candidate CeCe Heil lost their elections. The bloom is now officially off of Sarah Palin’s rose. The majority of voters in all five of those conservative states rejected candidates that share a political ideology with Palin. Those rejections follow on the heels of the recently released TheIowaRepublican.com poll which was conducted from July 25th through July 28th. It revealed that Palin is ranked a lowly fourth by Iowa Republicans regarding who they would like as the Republican presidential candidate in 2012. She was favored by only 11% of those polled. Hence, Palin and her political philosophy have been rejected in six conservative states just this month. Will the trend continue? Let’s hope so. Palin’s next tests come Tuesday when Alaska, Arizona and Florida hold their primary votes. In Alaska, Palin has backed Joe Miller in his long shot bid to defeat Republican Senate incumbent Lisa Murkowski. In Arizona, Palin went with Sen. John McCain in his Senate primary bid against former Rep. J.D. Hayworth. And in Florida, Palin has picked Republican candidate Marco Rubio in that state’s Senate race. Please remember to click on both song links below to familiarize yourselves with the tune and to have more fun singing along with today’s topical song parody. Enjoy! Sarah, why do you have no clue? Voters know that Rita has a unique blend of steel magnolia and mama grizzly. Her true grit has not escaped the eye of other Americans who know that at every level of political office we all benefit with commonsense constitutional conservatives in service. Oh, where to begin? Well first of all, Palin resorted to her common-man pop culture references with “steel magnolia” and her newly coined “mama grizzly”. What the heck is the message she is trying to convey with the reference to “steel magnolia”? Is she referring to the 1987 stage play, the 1989 comedy-drama film, or the country music duo that won season two of the television talent show Can You Duet ? In typical Palin self-induced confusion, her analogy is indecipherable. And “mama grizzly”? We guess that means that Meyer is another white, anti-feminist, abrasive, uncontrollable wild beast like Carly Fiorina, Sharron Angle and Palin herself. Moving right along, we then get to the part that says, “Her true grit has not escaped the eye of other Americans.” She included the predictable and obligatory pop culture John Wayne “true grit” reference of course. But what can be made of the rest of her sentence? Meyer “has not escaped the eye of other Americans”? Honestly, has anyone outside of Wyoming ever heard of Rita Meyer? Is she perhaps related to Oscar? It is becoming more and more apparent that Sarah Palin is frantically searching the country for female Republican candidates to endorse on a weekly basis. It is also apparent however, that she knows little to nothing about these candidates nor does she care. Sarah Palin simply wants to ensure that her name surfaces in the media as often as possible. She is a narcissist of the highest degree. Who the hell is Rita Meyer? Now she is in Palin’s choir! Will her profile now get higher?